The picture of this beautiful church was truly a gift to me. Its yellowing photographic postcard passed down to me from my immigrant great-grandmother: a link to the past. Its facade: a reminder of the connection that my ancestors and I share across language, cultural and geographic barriers - our mutual Catholic faith. Years ago when photographs of the little Catholic church in what is now Legrad, Croatia (in Koprivničko-Križevačka County) came into my possession, I didn't know much about the place. The church's name was a mystery, as was the Croatian handwriting. With a little bit of time, research and help from a translator, I was able to unlock a few of the clues that gave me some insight into this beautiful little church that figures so largely in my ancestral history. 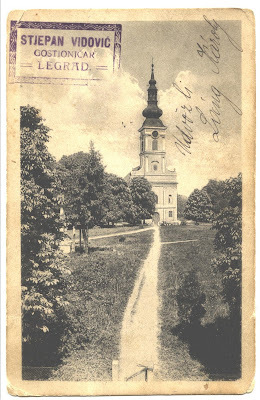 In addition to the postcard shown at the beginning of this article, I have in my possession a photograph of the church sent to my great-grandmother following World War II. 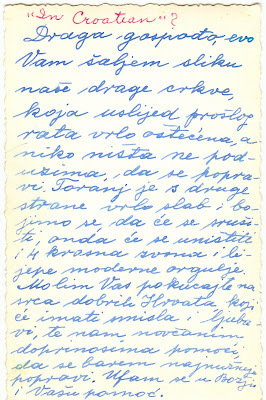 Inscribed on the back in the Croatian language is a plea for monetary help to assist in repairs because of damage to the church during the war. 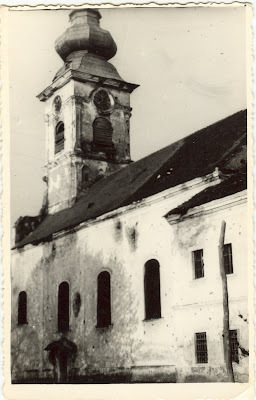 I'm sending you the picture of our lovely church, which was destroyed in World War II and is very damaged. No one is starting to do anything about it or starting repairs. We are afraid that the church tower is very damaged and that it can't stand in this condition longer. It can crumble any time and destroy four church bells and the organ. 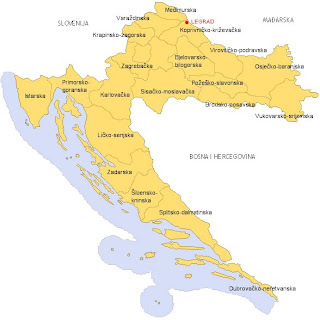 Please ask the generous Croatian people there who can send us some money for the first necessary repairs. I hope in God's and in your help. According to the translator the church was still in need of some repairs back in 2007, although it certainly has recovered much since its difficult days during World War II. 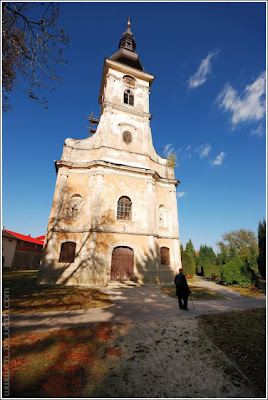 According to the Croatian National Tourist Board, the Holy Trinity Catholic Church (called Župa Presvetog Trojstva in Croatian) has a "harmoniously fitted belfry rising from the main front", several late Baroque-classicist altars, and a "Holy Sepulchre". The wall paintings within its sanctuary date back to 1793, while its pulpit dates to around 1798. Outside in Legrad's main square resides a group of five 18th-century columns. The central column features the church's namesake: the Holy Trinity. A column next to the center featuring St. Florian dates to 1735. 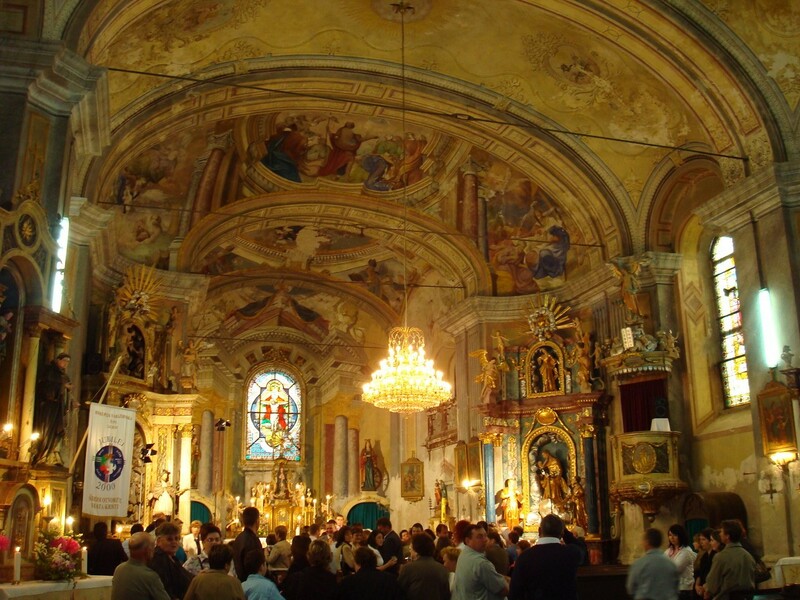 I enjoy thinking back to the many special family occasions that were celebrated within the walls of Legrad's Catholic church. My great-grandparents Ferencz and Ilona (Bence) Ujlaki, the patrons of this blog (you see their faces on the banner of 100 Years in America), were married there on what was probably a frosty winter day in February 15, 1905. Because of the step they took that day together in the sacrament of matrimony, and the gift they gave me by passing down their beloved Catholic faith, I am who I am today. And I am passing the light of faith down to my own children - the same faith that was sparked in so many of my ancestors' lives within the walls of the little church of Legrad. This article was written for the 109th edition of Carnival of Genealogy. 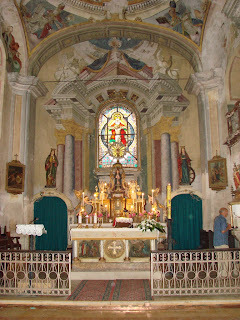 The theme is Places Our Ancestors Worshipped and it is hosted for the first time at the brand new blog The Catholic Gene. What a beautiful story - beautifully told in words and photographs. Thank you for sharing. I'm so glad you enjoyed reading, Cindy. Thanks for stopping by! What a beautiful human being u r . I reed and cry . God bless u.